I was in Pittsburgh for a conference. I had lived in Pittsburgh for 9 years in the 2000's but left 4 years ago. I now live in my hometown of Seattle, WA. I had a place in mind--called Jamil's--in East Liberty. I used to work with Jamil's son, and I know his business has been there for a long time. I ended up at a completely different place, called Boom Concepts, instead -- which is on Penn Avenue in Garfield. 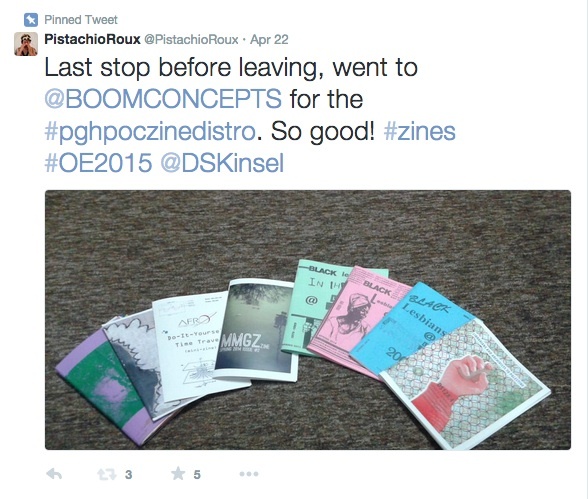 I saw a tweet about #pghpoczinedistro and I knew I had to get there. I emailed the organizer, Bekezela Mguni, and we met up in the morning before I left town. I bought $32 of zines - which was all the money I had on me. I am a bibliophile. I love zines especially because they are a very immediate way to tell stories not well represented in other media. The titles I ended up picking include: Afro Futurist Affair: Do-It-Yourself Time Travel; MMGZ zine Issue #2; 2 various zines by D.S. Kinsel, Librarians and archivists to Palestine; and all 3 Lesbian Herstory Zines: Black Lesbians in the 80's, 90's, and 2000-10. There were so many great zines, art, and you could tell the place was used in many different ways. It opened about a year ago and I recommend checking it out if you're in Pittsburgh.